At our office Monday through Friday 9am-5pm. On RACE DAY at our office 9am-2pm (Go in through Gate 12) or on Race Day- you can buy tickets at the box office/gate after 4:00pm. Tickets are always available on race day. Where is Dirt Oval 66 Located? We are located at the intersection of Route 53 and Schweitzer Road in Joliet, IL. Vehicle entrance is East of Route 53 on Schweitzer. For the Box Office enter at Gate 12 and for General Parking enter at Gate 13. What are the ages for Juniors? Juniors ages are 3-12. Children 2 and under are free. 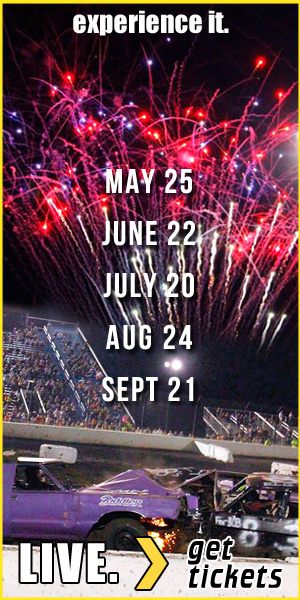 Junior pricing applies to general admission grandstand tickets only. When does advance ticket pricing stop and week-of start? The last day for advance ticket pricing is 2 weeks prior to event day. Do you charge for parking? Yes, $5 per vehicle. Do you sell Reserved Seats? Yes, Section 101 in the middle of the grandstand is dedicated to Reserved Seating. Can I use a credit card to purchase pit passes? Yes, we accept credit and debit cards. Can I buy pit passes online? Yes, and on event day as well. How long are the 5-pack Season Passes for Team Demo’s available? All advanced and discounted ticket prices are available until 2 weeks prior to event day. Do you have designated motorcycle parking? Yes, available near the front entrance. Can I have a birthday or anniversary announced? Yes, use the form on the Fan Page and make the request by the Friday before the race. How many people are allowed to accompany a wheel chair in the ADA section? We allow ONE companion/friend seat per wheelchair. Are we allowed to smoke in the grandstands? No, tobacco products are not allowed in the grandstand area. What are the ticket delivery fees? Delivery fees are PER ORDER and not per ticket. Fees include Sales Tax, Convenience Fees, Credit Card Fees, and Processing Fees. What are the office hours? Monday through Friday from 9am to 5pm and on race day (Saturday) 9am to 2pm. Is there assigned seating? Yes, Reserved seating is available in Section 101. All other seating is GENERAL ADMISSION. General Admission (GA) refers to seating or standing areas that are not assigned or reserved, and are occupied on a first-come, first-served basis. Please note: The first ten rows may have restricted viewing.